When I last left you, I had finished the collar of the frock coat. I won't come back to the collar for a long time, so I really did it out of order, but that's all right. 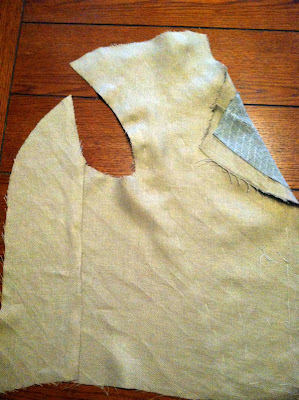 The next thing I did was baste the finished canvas to the coat fronts, and pad stitch the revers (also known as the lapel). 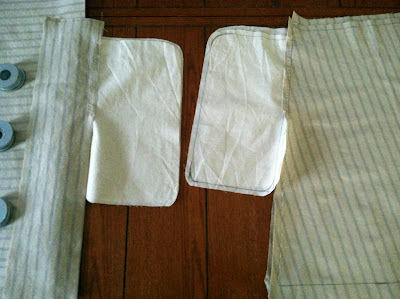 Here you can see (and you can click for larger images) the pad stitching which lends the revers its shape. I haven't ironed it, but it maintains a fairly sharp crease, and also curls back toward the point of the revers. 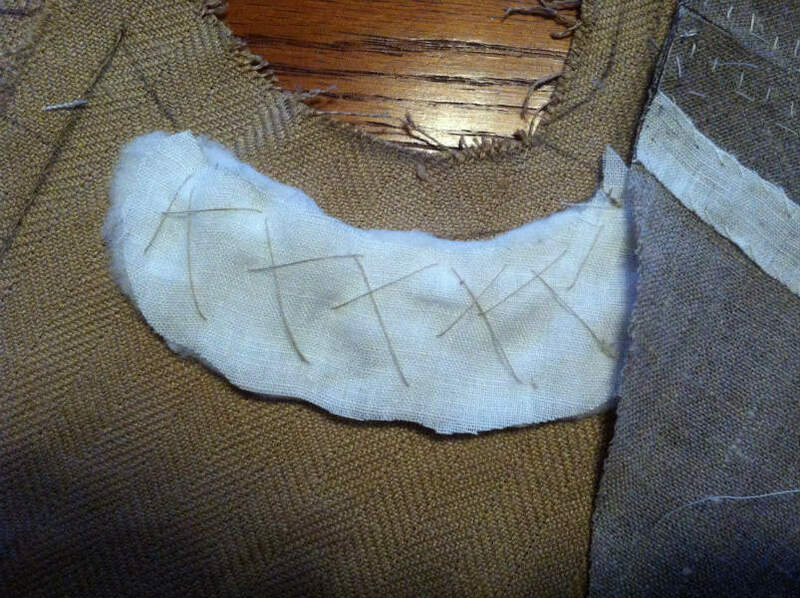 Underneath you can see the dart that gives the chest some shape, and a few dimples where the pad stitching is. Underneath the armscye I've added a little padding. 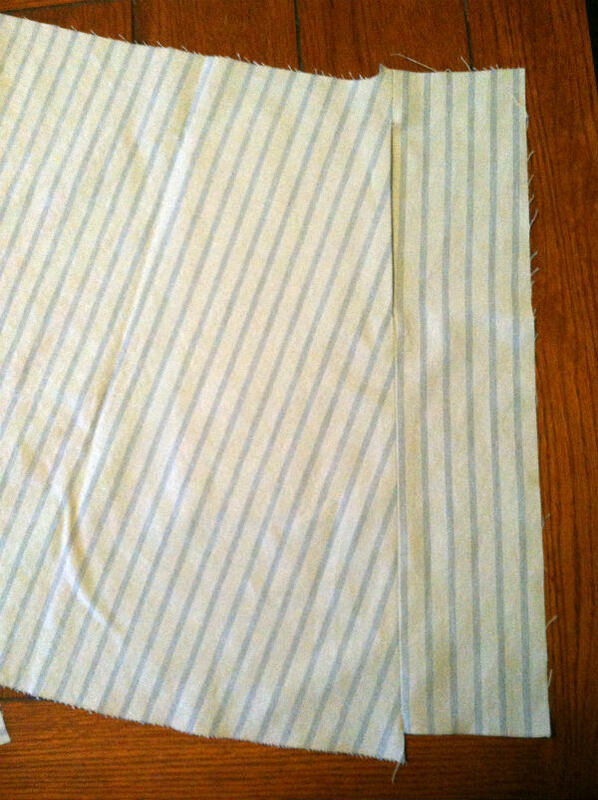 This is batting covered by thin linen which I've pad stitched to the fabric. This will fill out the little hollow under the arm. A final picture of the completed interior of the front of the coat. 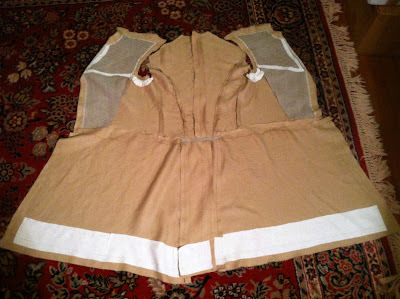 Now I've attached the back and skirts, and added a strip of linen at the bottom hem to help keep the coat draping properly. 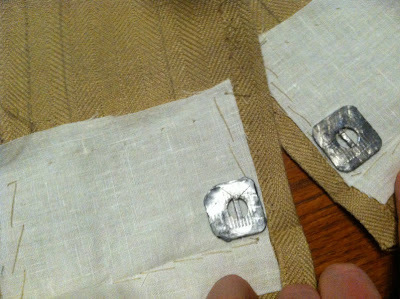 In addition to the linen strip, I've also added a few lead weights. 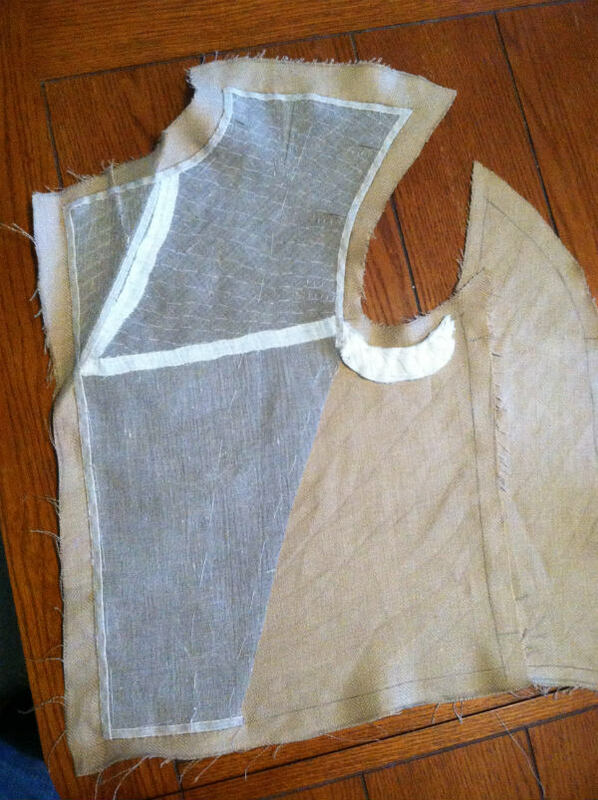 This is a very soft linen coat fabric, and the weights will help it hang properly. I've begun turning in the fronts in anticipation of adding the facings. 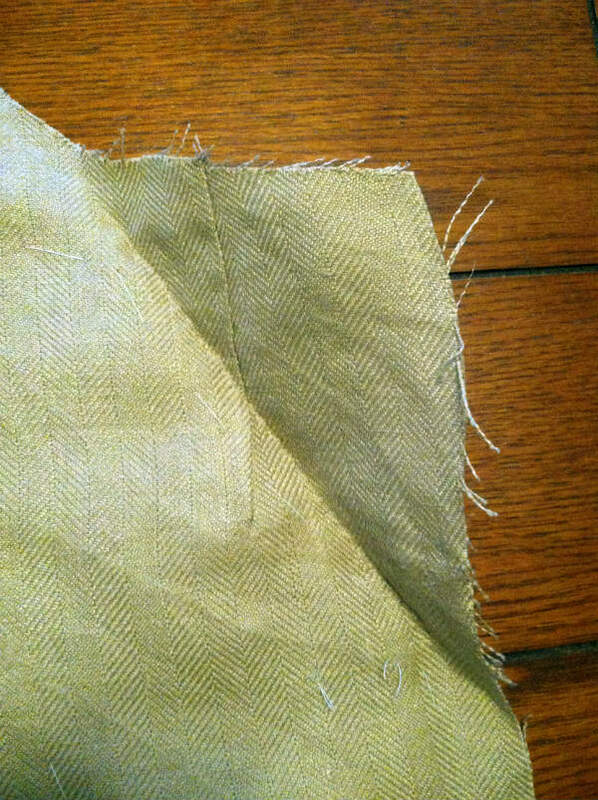 You can see here an additional piece of linen added to help support the buttons along the front edge. Now to add some pockets. There are no side or front pockets on this coat, to maintain the proper form, but instead it has two pockets hidden in the tails. I've cut the lining for the tails in two pieces, and made pocket shapes. 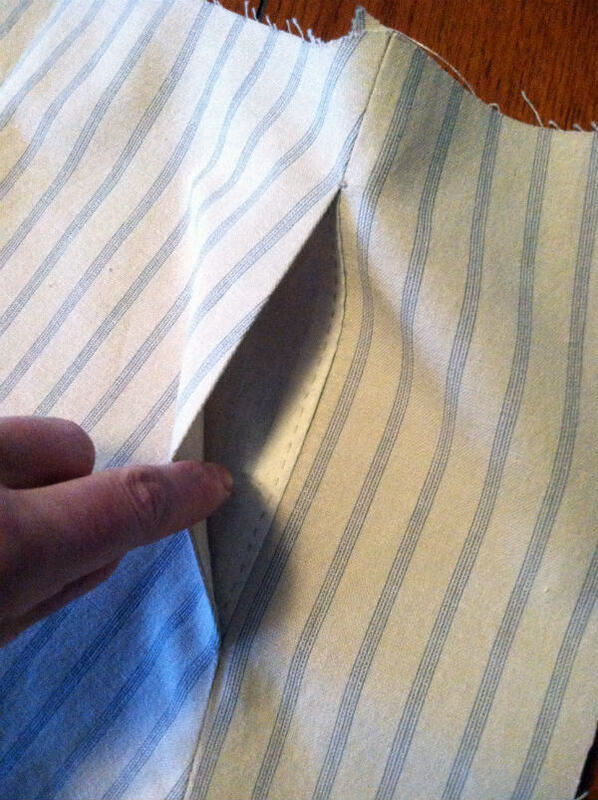 In retrospect, I should have cut the pockets to be shaped within the red dotted lines - this would have helped them hang straight, since they would have been supported by the waist seam. The finished pocket. 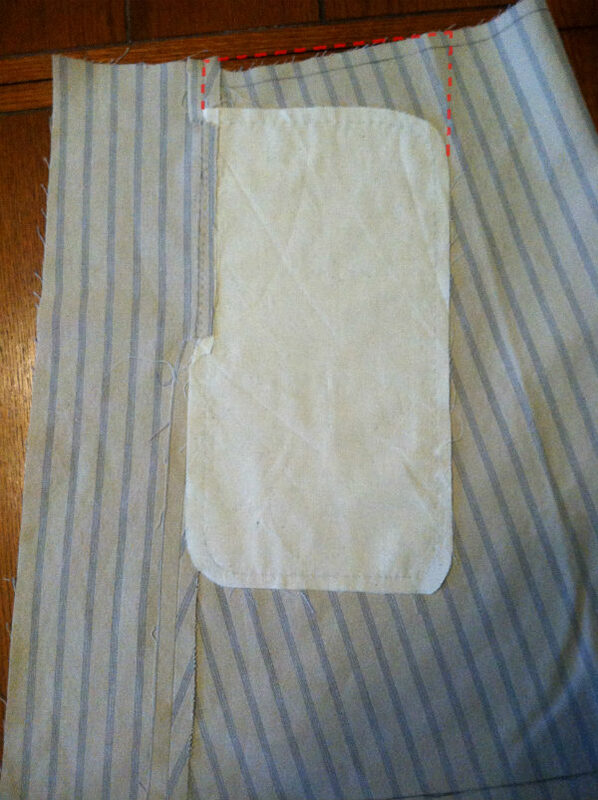 It may be hard to see, but I've added reinforcement at the corners of the pocket opening so it doesn't rip open. A closer look at the pocket. Completed skirt lining. 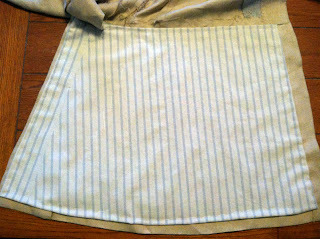 On this side the pocket is at the top left of the lining, by the top of the back vent opening. It looks beautiful! You're so thorough in your techniques. Wonderful! Great attention to details. Thanks for sharing. Do you ever have issues with lead weights showing through? Some of my clients ask for them so I have been buying covered ones that you can catch with thread so they don't ever move or get loose. 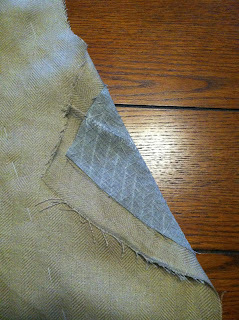 Love to see real pad stitching and thought going into the guts of a jacket...have you ever thought of making a video? This is the first time I've tried using the weights. So far they haven't shown through, but every once in a while when they hit something there's a "clunk." I think in the future I would just use a heavier fabric for the edge interlining, or just not worry about it. After I've added the lining the coat is a lot heavier, and seems to drape better. As for a video, I'm not sure I'd want to show how slowly I sew! Oh Andrew we sewers who sew with passion are not meant for speed. Precision is everything! Just following along with your blog is intriguing enough but I'd love to see the process of cutting out and deciding about all the parts and which to start first with some progression and a voice or live body.Your wife is a lucky woman!